This is my 15th post in my MLB In Detail post series this April. The Mets have improved greatly from past years and are due for a better season. In the off season, they acquired Michael Cuddyer from the Rockies and John Mayberry Jr. from the desperate Phillies. They also will have Matt Harvey healthy and active this year, which will be a great help. They’ve also added Bartolo Colon from the Oakland Athletics to help the starting rotation. In the infield, they have Lucas Duda, Daniel Murphy and Wilmer Flores. Other than that, they don’t have anybody too good. There’s four positions in the infield. On;y three guys that are actually good play. There’s a hole at third base. Wait, what happened to David Wright? He got injured. Yet again on this team, injuries is a deciding factor. Travis d’Arnaud, the catcher, is also on the 15 day disabled list. The injuries make position holes, which lower records. This will make the Mets decent rather than good. Putting injuries aside, the Mets outfield has no holes, but no backups either. They don’t have any backups on the disabled list or in rehab either. They do have Curtis Granderson, Michael Cuddyer, and John Mayberry Jr. to fill the outfield but what if one of them gets injured. So, the Mets are going to be okay, but with injuries being a factor, they won’t be too good. My prediction for the Mets is that the Mets are going to come in 2nd place in the NL East, finishing with an 84-78 record, being ranked 16th overall. The Mets will be a good team, but not good enough if the injuries continue. This is my 14th post in my MLB In Detail post series this April. The Mariners have most of what they had last year. They lost Michael Saunders and Justin Smoak to the rebuilding Blue Jays, but they didn’t anyone else, except Chris Taylor to the disabled list. Nelson Cruz was recently added to the team. He was the main factor in the Orioles winning their division, will he do the same for Seattle? Robinson Cano, acquired from the Yankees last year, will surely help the Mariners as well. The infield is a weakness, only holding Kyle Seager besides Cano. They have a pretty full roster otherwise. The starting rotation consists of King Felix, J.A. Happ, Hisashi Iwakuma, James Paxton and Taijuan Walker, all at least decent pitchers. The outfield has also been filled well. Along with Nelson Cruz, the Mariners have Dustin Ackley as a dependable oufielder, and Mike Zunino as a dependable catcher. They also have a decent backup in Seth Smith. If he’s backing up, who’s in center field? The Mariners acquired former Detroit Tigers lead off hitter and center fielder, Austin Jackson, to play center field. I think Seth Smith should play designated hitter though. After the loss of Kendrys Morales, there has been a hole at designated hitter for the Mariners. Rickie Weeks who is not that good, is the current DH so Seth Smith is the next option. My prediction for the Mariners is that they will come in 3rd place in the AL West, finishing with an 84-78 record, being ranked 17th overall. The Mariners have their holes, but a few solid areas can get them where they’ve gotten, a little above .500. This is my 13th post in my MLB In Detail post series this April. The Athletics are in the middle of starting over, but have already acquired some key players and held on to some of their best material. The Athletics have pieces, just their puzzle hasn’t been put together yet. They held on to majority of the good guys in the outfield, including Coco Crisp and Josh Reddick. But the infield ha some missing pieces. They lost Brandon Moss to the Indians and traded Josh Donaldson to the Blue Jays for Brett Lawrie, one of the good new additions to the roster. They also stole Ben Zobrist from the Tampa Bay Rays. The biggest changes of all were in pitching, but before we get to that, trading Yoenis Cespedes didn’t do anything for the Athletics. They let him run free and he ends up being a threat on the Tigers. Jon Lester is on the Chicago Cubs now, and Jonny Gomes plays for the Atlanta Braves. Now, back to pitching. Bartolo Colon is on the Mets now. Sonny Gray is still there along with Tyler Clippard and Sean Doolittle, even Jarrod Parker. They also picked up Scott Kazmir from the Indians. Back to hitting, they even got Billy Butler from the Kansas City Royals and Cody Ross from the Arizona Diamondbacks. Ross is a former Red Sox, from the horrible Fenway 100th anniversary team from 2012. The Athletics are actually in better shape than I thought they were. But the A’s have one problem. That problem is injuries. Although it’s only temporary and not their entire regular roster, it can cost the A’s numerous wins early on, making for a tough April and May. That’s one third the season. They have Coco Crisp, Sean Doolittle, Sean Nolin and Jarrod Parker left to rest in peace on the disabled list for a month or two. Those are some of their biggest winning keys, out for possibly one third the season. My final prediction for the Athletics is near .500 due to the early injuries. My final prediction for the Athletics is that they will come in 4th lace in the AL West, finishing with an 83-79 record, being ranked 18th overall. The Athletics are in good shape, if they can ever become healthy again. This is my 12th post in my MLB In Detail post series this April. The Braves are in the middle of a rebuild. They have lost most of their best players, including star closer Craig Kimbrel. It also includes star hitter and outfielder Justin Upton and another good hitter in B.J. Upton. All these players have at some point, been traded to the Padres. The rebuilding Padres are clearly feeding on the also rebuilding Braves. The Padres are definitely a step ahead of the Braves in the rebuild. However, the Braves are left with some good players to help them get at least near the .500 mark, along with some new add-ons to the team. These players include only one hitter that originally was on the team. This hitter is first baseman Freddie Freeman. Freeman joins three new additions to the roster that will help the lineup. The first used to play for the Baltimore Orioles, Nick Markakis. There, they miss him dearly as he was a key to the 2014 division win the O’s pulled off. He was desperately needed by the rebuilding Braves who didn’t already have someone as good as him. The second is to replace another guy the Braves lost to the astros, Evan Gattis. When Gattis left, it left a hole at catcher. well, that hole has been filled well with a starter and new backup. Christian Bethancourt is the new and dependable starting catcher. A.J. PIerzynski, who proved he can only handle being a backup rather than a starter last season by stinking as Red Sox starting catcher, then doing well backing up for the Cardinals catcher Yadier Molina, who was injured when they acquired him. Pierzynski will continue as a backup catcher, this year for the Atlanta Braves. The third guy is former Red Sox and Athletics outfielder, Jonny Gomes. Gomes is OK, but you’ll definitely need a backup for him, which the Braves don’t have, making Gomes the only option, and he’s weak when he plays too much sometimes. The startin rotation has also really improved. Mike Minor is injured, but him and Julio Teheran are still going strong in the rotation. They also added Alex Wood to help Teheran and Minor. My prediction for these decent Braves is to come in 3rd place in the NL East, finishing with an 80-82 record, being ranked 19th overall. The Braves did lose many good players, but the rebuild may be effective if you combine the new and old players that I said will help the team. This is my 11th post in my MLB In Detail post series this April. The Brewers are still good, but not at every position, and not extremely good. Hopes are for a decent Brew Crew this season. They started pretty healthy, that’s one provblem avoided, knock on wood. They have many players to help the team out. Ryan Braun should have a much better year. Aramis Ramirez is pretty good, and Jonathan Lucroy is another star to watch. Also look out for Carlos Gomez and Khris Davis in the outfield. Scooter Gennett and Jean Segura are also decent infield picks. The Brewers were very quiet in the off season after their huge September collapse. However, they did make one big move. They signed Adam Lind in the off season. Lind is a former Toronto Blue Jays first baseman/designated hitter who has been replaced by Toronto’s new addition of ex-Seattle Mariner Justin Smoak. Lind will play first base, and first base only for the Brewers, since the National League doesn’t have a designated hitter. He may play designated hitter in American League stadiums though, giving Luis Jiminez a chance to play first. Now I need to talk about keys to the 2015 Brewers pitching staff. The Brewers have a pretty dependable rotation, including Matt Garza, Kyle Lohse and other pitchers who may not be stars, but are enough to fill the rotation spots effectively. The bullpen is also pretty decent, including Jonathan Broxton and Francisco Rodriguez. My prediction for the Brewers is for the Brew Crew to come in 5th place in the NL Central, finishing with an 80-82 record, being ranked 20th overall. The Brewers’ rank doesn’t say it, but much like the White Sox, but with an actual middle team record, the Brew Crew will be one of this year’s middle teams. This is my 10th post in my MLB In Detail post series this April. The Rays already had a bad team this year. When you add injuries to 10 important players, things get even worse. The Rays started the season in injury mania, where over seven Rays players took a trip to the disabled list. The disabled list currently includes good starters Alex Cobb along with Drew Smyly, designated hitter John Jaso, and infielders James Loney and Nick Franklin. The Rays ave lost nearly their entire rotation plus important infielders to the 15 day disabled list to start the season. It leaves them with only a few stars including plenty of outfielders, but we should see some improvement once this monster wave of injuries ends, if it ever does. Evan Longoria, the best hitter on the Rays, is included in the few stars left though. It also left lead off hitter Desmond Jennings to help. Chris Archer and Jake Odorozzi will hopefully lead the rotation, being the only guys left who’s normally in this Rays rotation. David DeJesus was also left to play DH, along with outfielder Brandon Guyer. Other than that, the Rays are left with stinky backups. well, a few good backups, but most stink. Lastly, I’d like to share my prediciton for the Rays. Due to the injured players coming back, I have higher hopes for the Rays later in the season. With that in mind, I predict that the Rays will come in 4th place in the AL East, having an 80-82 record, being ranked 21st overall. The Rays will not fare well to start the year with many injuries, but will later be able to do well if they start to become healthy later in the season. The Bruins may have been bumped out of the playoffs last night, but today they helped helped bump out cancer with their biggest and most famous fist-bumping fan, Liam Fitzgerald, a cancer survivor. 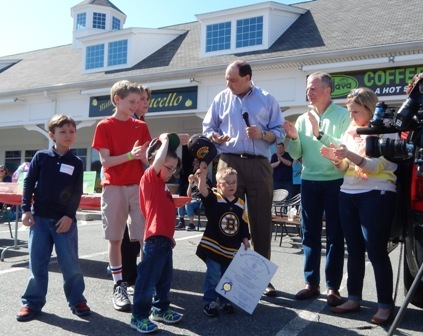 This event, called “Northborough – Get Your Bump On” was a community fist-bumping event where people could line up to fist-bump Liam. 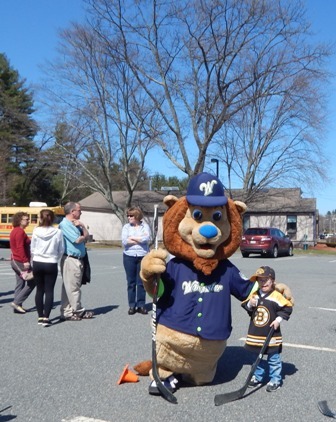 The event raised money for the Leukemia and Lymphona Society, an organization that raises money for blood cancers. There were three other cancer survivors: Christian Campero, Max Blasko and William Furgal, who were also recognized at this event. 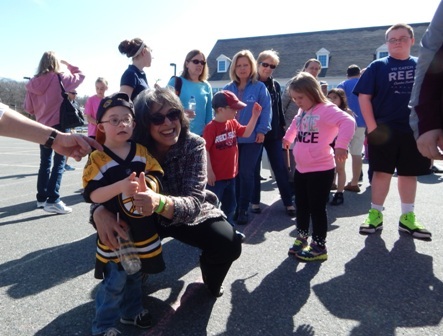 Event organizer Julie Stanwood, who is also director of Friends of Families in Transition, got the idea to start the event after watching Liam on TV fist-bumping the Bruins players. Stanwood said. She was able to get multiple local companies to sponsor the event, such as Uno’s Pizzeria, Berkshire Bank, Wegman’s, TD Bank, Buffalo Wild Wings, Lala Java, Core Connection and many others. Liz Nolan, founder of Northborough Mom’s and Tots, also helped organize this event and created a Facebook page to spread the word called “Northborough – Get Your Bump On”. 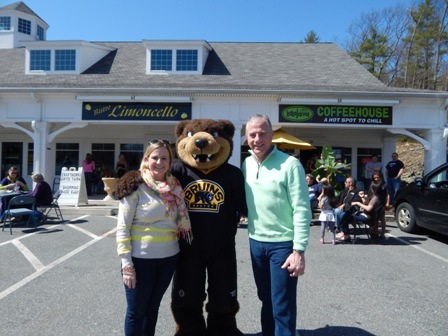 Legislators Harold Naughton Jr., Danielle W. Gregoire and Jamie Eldridge were also there to support Liam and they honored him with a recognition award from the Massachusetts House of Representatives. 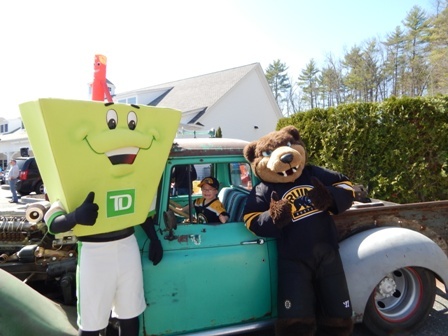 Adding to the excitement were mascots from various sports teams and organizations including Blades of the Boston Bruins, Jake of the Worcester Bravehearts and the mascots from Buffalo Wild Wings and TD Bank. A lifesize Mater from the movie “Cars” owned by Jonathan Gabriel from Armory Motor Storage was also there. She also wanted to thank Julie Stanwood and Liz Nolan for organizing this event. 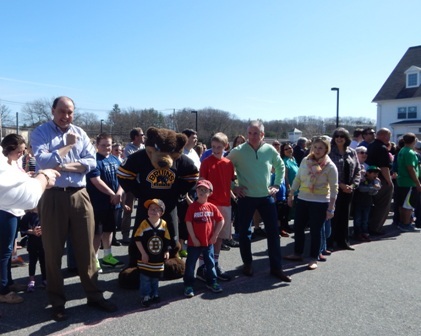 Over 400 people participated in the fist bump and over $4,800 was raised at today’s event.